The Homeless Task Force pilot program aimed to house 75 people in 60-90 days. UPTOWN — While the city reports Chicago's homeless population has dropped over the last year, Uptown's homeless population has grown by nearly five percent in that same time span, according to an annual count. According to the count, completed nearly eight months ago, Chicago's homeless population dropped 13 percent — from 5,889 people experiencing homelessness in January of 2016 compared with 6,786 the year before. In Uptown, those numbers grew from 41 people to 73 people, according to the count. "There are a large number of social services that people who are experiencing homelessness rely on that are located in Uptown and not in other neighborhoods," said Ald. James Cappleman (46th). Uptown has the most subsidized affordable housing units in the city and other areas need to "catch up" especially when it comes to those most at risk to become homeless, Cappleman said. "If other neighborhoods would provide this type of low-income housing with social services, you would see a serious reduction in homelessness throughout Chicago, including Uptown," he said. The count also found a 22 percent drop in veteran homelessness since last year citywide. Chronic homelessness is down 68 percent and the number of minors living homeless without an adult is down 14 percent, the city report said. Mayor Rahm Emanuel said in a statement Monday that "while we are encouraged that we have fewer residents impacted by homelessness this year, our work to address homelessness is not done until every Chicagoan has a place to call home." The decrease recorded in the city-wide count may be attributed to a number of factors, said Julie Dworkin, director of policy for Chicago Coalition for the Homeless. While the count may have shown a drop with some homeless populations, Dworkin said the count is flawed because its "narrow" definition of homelessness doesn't include families who are "doubled-up" living with friends or families, instead of on the streets or in shelters. Uptown wasn't the only neighborhood to see an increase in homeless people. The biggest growth was in Logan Square and Avondale. Between 2015 and 2016, Logan Square's homeless population grew from 15 to 45 people and Avondale's grew from 5 to 45, according to the count. As Uptown residents have done, residents in the Logan and Avondale neighborhoods have complained about a lack of affordable housing and gentrification. 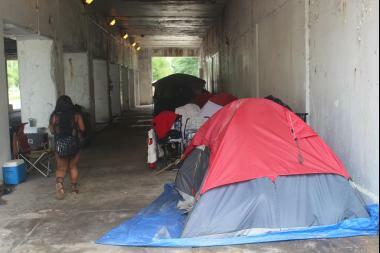 This summer, the city took aim at reducing Uptown's Tent City, the homeless encampment under the viaducts near Lake Shore Drive. The Task Force to Reduce Homelessness brought together homeless advocates and nonprofit agencies to provide "permanent housing." When the program was announced some housing advocates called the program "a sick joke" and that the program's 75 available housing slots would barely make a dent in the city's homeless population. In August, Commissioner of the Department of Family and Support Services Lisa Morrison Butler announced that it had only housed 21 people during its 60 to 90 day window it set for the pilot program. While she didn't reach her goal, she vowed the fight wasn't over. Meanwhile, another tent city has popped up at the former site of Stewart School, 4525 N. Kenmore Ave. Fifty-one-year-old Shawn, who declined to give his last name, said he's been coming to the site all summer to listen to music with a few friends. "When I want to socialize I come up here and jam to some oldies," he said, adding he's not anti-social, but prefers to live in solitude. "I used to know a lot of people, but a lot have died of alcohol poisoning. That's why I'm sitting here alone." Shawn lives in the Loop, which over the last year has seen a dramatic decrease in its homeless population. In 2015, the neighborhood had 131 homeless people and in 2016, it had 75 people, according to the count. "I come down here because it's real people here. I live [Downtown] because the homeless quality of life is better," he said.